Sometimes, the best recipes are born out of leftovers. Case in point: these zany spring rolls, made from the remaining rice paper wrappers from the previous night’s dinner party, along with whatever else was in the pantry that sounded good. Not always the premise for a delicious meal, I know, but this time, ladies and gentlemen, we have a winner! Given my global pantry, there’s a whole lot of cross-cuisine fusion happening in both the rolls and their accompanying dipping sauce. 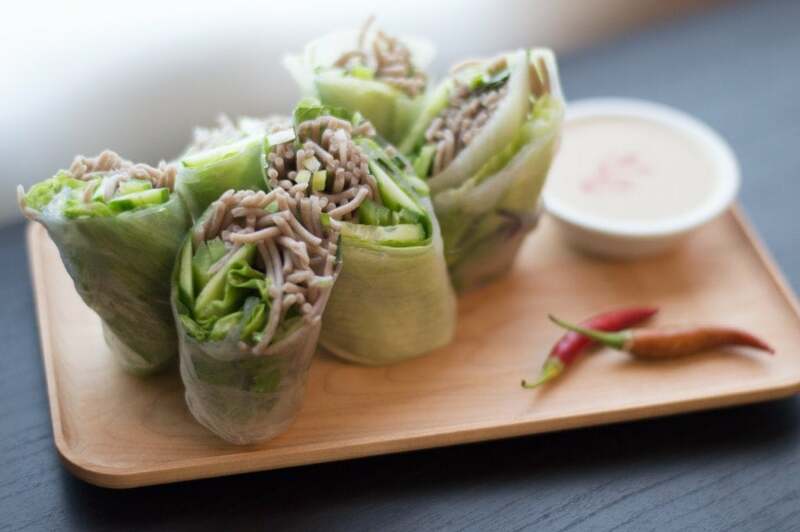 Vietnamese rice paper wrappers are stuffed with Japanese buckwheat soba noodles, along with Thai basil and a pile of crisp, fresh vegetables. As for the sauce, it’s based on an unlikely combination of Middle Eastern tahini, Chinese hot sesame oil, Japanese ponzu sauce, and lime juice. Grated ginger, garlic, and chopped Thai chiles give it a fresh and zingy after-burn, while a spoonful of sugar rounds out all of the flavors. These rolls make a great appetizer or first course — they’re a salad in finger food form. Eat them right away, since the noodle wrappers only stay fresh for a couple hours. They keep reasonably well for a day or so wrapped individually in plastic wrap and refrigerated in an air-tight container, but they probably won’t last that long! Oh, and if you’re not in a spring roll-making kind of mood, you can forego that format entirely and make a salad instead. Just shred the lettuce, top it with the rest of the filling ingredients, and drizzle the sesame sauce over the top, adding sliced chicken or tofu if you like. 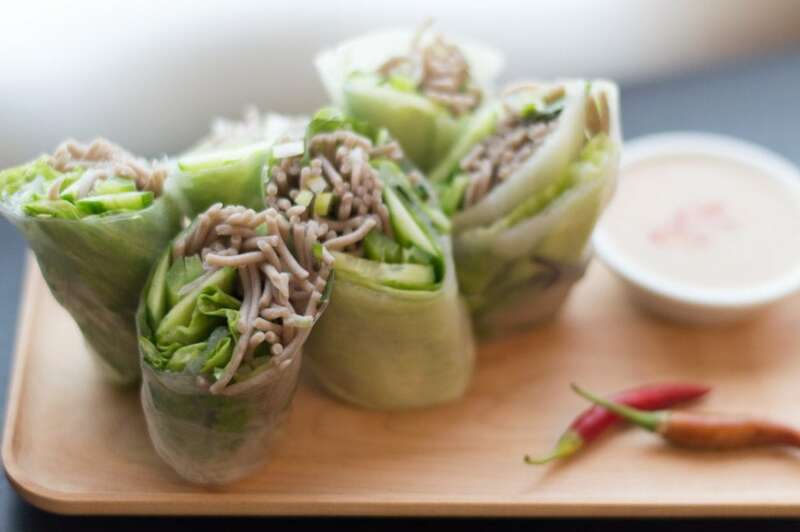 Rice paper rolls stuffed with fresh vegetables and buckwheat noodles. Served with a tangy, spicy dipping sauce. In a small mixing bowl, combine all of the sauce ingredients. Stir well, until the sugar has dissolved. Set aside. 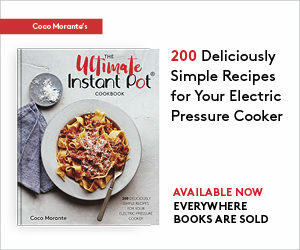 Fill a round dish (I like to use a 10-inch cake pan) with warm-to-hot water, about 160ºF. Dip one of the spring roll wrappers in the warm water for a couple seconds, shake off the excess water, then lay flat on a cutting board. 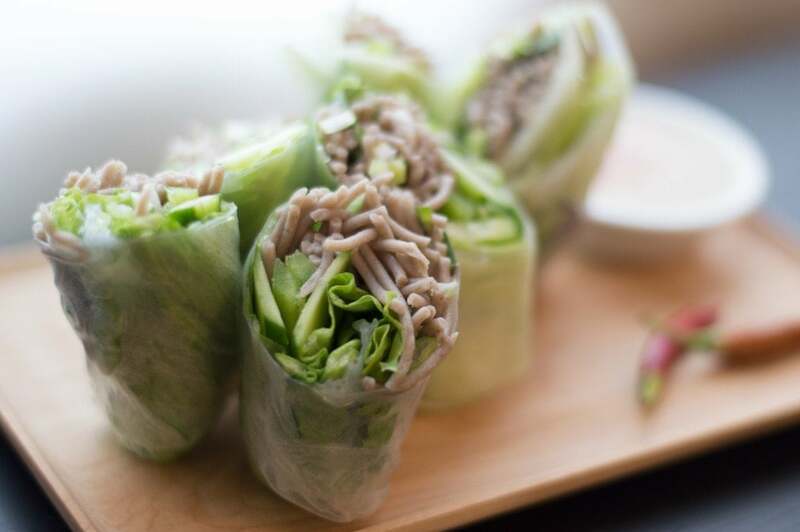 Place a leaf of lettuce on the bottom third of the rice paper. On top of the lettuce, add a couple slices of cucumber, a few strips of jalapeño, about a 1/2 cup of soba noodles, a few leaves of Thai basil, and a generous sprinkle of green onions. Begin to roll the rice paper wrapper from the bottom to the top, folding it over the ingredients. Tuck in the sides and continue to roll, just as you would a burrito. Set on a platter and repeat the process with the remaining ingredients. 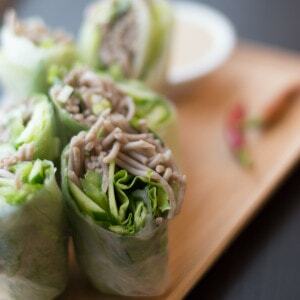 For a pretty presentation, slice rolls diagonally before serving. Yum, I like the sounds of these. I have some leftover rice papers, soba noodles, and tahini right now! 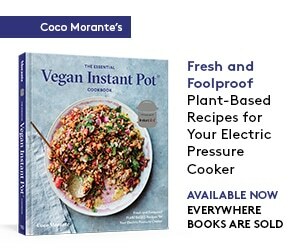 I think I have dinner plans. Awesome! I hope you enjoy them, Caitlin!